It’s not hard to see why security is sought after. We as people crave safe and secure living areas, as well as safe and secure business areas. Nobody would want to live in a house that was unsecure, just the same as nobody wants to work for a business with no security. Safe family members and friends will feel better in your home, just as safe and secure employees will feel better about working at your company. 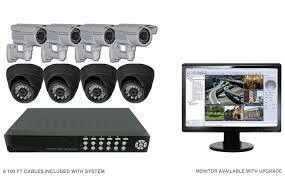 We provide CCTV Systems in Ajax that help. CCTV cameras are the first step to providing you with powerful security here at Locksmith Ajax. These security cameras are high quality and designed to provide clear imaging and video of the locations you wish to secure. We can install cameras for you in any number of locations, such as entryways, exits, hallways, back doors, and much more. The more cameras you have installed, the more secure your property will be. Criminals may not be the smartest people in the world; they break the law, after all. However, they are smart enough to know what it means when they spot a security camera during their criminal activities. Instead of risking their cover, they will most likely run for it as soon as they spot one. That’s why we highly recommend our security cameras installation for your home or business. When you order a new CCTV system from us here at Ajax Locksmith, you’ll get the best deal in town. You’ll also get professional CCTV installation from experts you can trust. We have a wide variety of equipment to choose from, including many different kinds of commercial system. The choice is yours, and the prices are incredible. Contact us today for the best deal in town on all CCTV services including sales, installation, and repair. We do it all because we are committed to providing the most efficient solutions for home and business security needs.